The second running of the West Coast 400km Cape Audax certainly wasn’t lacking in variety – although when it came to weather, not all of that was good news, especially earlier on in the day. The first of those observations would be that I nearly didn’t ride at all. I’d been feeling well below par the whole of the previous weeks – with some significant aches in my joints, especially neck and shoulders. It was hard to attribute these to anything specific. Maybe the different position from doing more mountain biking recently in preparation for the 36One? Or perhaps I was coming down with a bug. Whatever the cause though, I really did not feel like riding – especially so when the alarm went off at 10:30pm. I’d gone to try and get some sleep a bit after 5pm, but it had been patchy at best. Nope, I really wasn’t feeling like starting a 400km ride. But that was exactly the reason I did get in the car and head out to Vrede Wines for the start. There’s no telling how good or bad I might feel at the start or during PBP, so today would be a valuable lesson in tackling a big ride when not feeling 100%. We rode steadily but at a reasonable pace to the 2nd control in Riebeek West where Hendrik was again waiting for us with his legendary road-side hospitality – table out with muffins, beskuit, coffee and water. I nearly packed up there and then. Along the road from Wellington my stomach had been feeling decidedly queazy – neither snacks or drinks were going down well. It was 4am, it was dark and cold, there was a rain storm coming, and I felt like crap. Getting in Hendrik’s car would really have been an easy option. But I passed up the chance and pushed on. The coffee from Hendrik’s control started to work some magic, and my spirits improved. I added another really good cuppa in Moorreesburg, and a couple of also very goo cups at the wonderful breakast laid-on by Ella in Hopefield. It was a healthy dose of caffeine, and it worked. I did slump again a bit around Vredenburg, but instantly spotted a lack of fuel as the problem. Our restaurant stop in Saldanha may have been bizarre in the extreme, but it set me straight again. I’d decided that a Hawaii Pizza was the perfect fuel – pineapple for short term energy, some carbs in the base to keep the fire going once lit, ham for the muscles, and the cheese to add some long slow burn fuel. It was probably all in my head, but it kept the engine turning wonderfully through the scenic delights of the West Coast Park and all the way onto Yzerfontein. My choice of pie at the Spa stop was perhaps a bit less inspired. I should have stuck with my usual coffee too and not dallied with a Red Bull. For most of the road through Darling and to Malmesbury my stomach was really struggling again. On a couple of occasions I came close to throwing up by the road side, and even my usual order in the Wimpy did not go down well at all. I managed the coffees and some chips, but barely got half way through the toastie. We were lucky with the wind though – it died off completely and we positively flew over the last 48km home. I remember chatting with Theunis about how neither of us had struggled with our legs all day. His bum was killing him, and my stomach had been playing up on and off all days. But we’d ridden steadily and with relative ease all day. I guess you have to take that as a result – a 400km ride when the systems are out of shape, completed well within cutoff and without struggling physically. Not the most fun type of preparation for PBP, but valuable nevertheless. In the report from our November ride we already covered the essential facts and figures of the current Cape 400km route. To avoid going over old ground, this report will pick out some of the highs and lows from our second ride of this route. The first, and possibly lowest of the lows has to be the thieving little sh*t who helped themselves to parts from Tom’s bike whilst he was getting his brevet card signed in McDonalds in Stellenbosch. Being Tom’s first control on his first Audax, he hadn’t quite got himself organized at the process of getting through controls. His fellow riders in the fast group were already starting to kit up for riding out as Tom was finishing up. Luckily Tom was out before they had a chance to remove anything major enough to end his ride there and then, although what they did take would have made most consider abandoning. Fortunately Tom is a tough character, and he wasn’t to be deterred. Perhaps what is most notable and remarkable about the incident, apart from the sheer cheek of it, is that it’s the first we’ve had since starting the Cape series last year. We’ve had a couple of slightly suspicious roadside incidents, and Peter witnessed a spectacular punch-up from a safe distance in the small hours of the morning in Wellington. But this is the first incident that has affected any of our riders directly. Hopefully we’ll avoid such incidents in future but let’s make sure we look out for ourselves and each other out there. You did realise you were meant to be learning some French in preparation for PBP, didn’t you? OK, we’ll help out this one time – ‘le relais’ means ‘road house’. 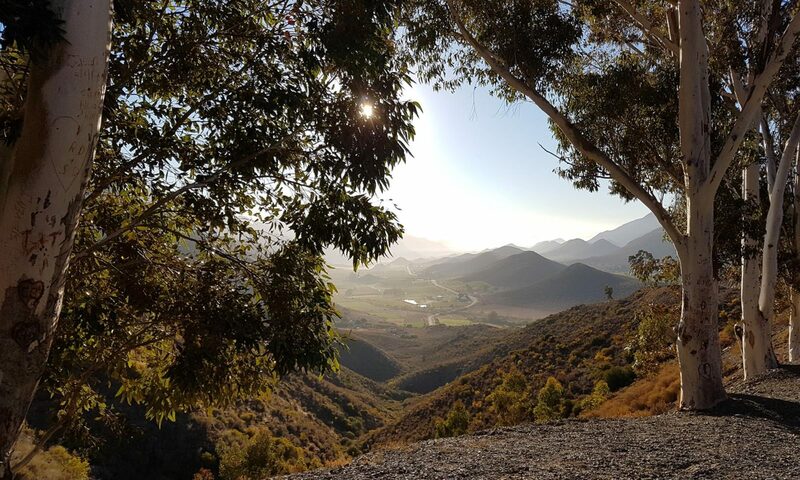 Hendrik Vermaak may have manned the Riebeek control with his car, but at 3am he had all the hospitality you could wish for from a roadside inn on a dark and stormy night. There was light, and fresh water for bidons, jars of beskuit, and packs of muffins. As if that weren’t enough, Hendrik had laid on that staple of all cyclists – plentiful supplies of hot coffee. A few days ahead of the ride it looked like we would be standing around in deserted streets gathering ATM slips as our proof of passage, or visiting the SAPS for a signature and stamp. Either way, we’d have been wondering if we had enough water left to make it to the next control. How much more pleasant to be standing around Hendrik’s car, laughing and joking and contemplating if there was time to quickly swig down an extra cup of coffee before mounting up and pressing on. A massive thank you to Hendrik from all of the Cape Randonneurs for coming out at such an unearthly hour to make our ride so much more pleasant. Somewhere along the road to Moorreesburg a light drizzle started to fall. Barely more than a mist in the air, but enough to be picked out in the beams of our headlights – pinpoints of light in a mesmerizing dance ahead of the bikes. 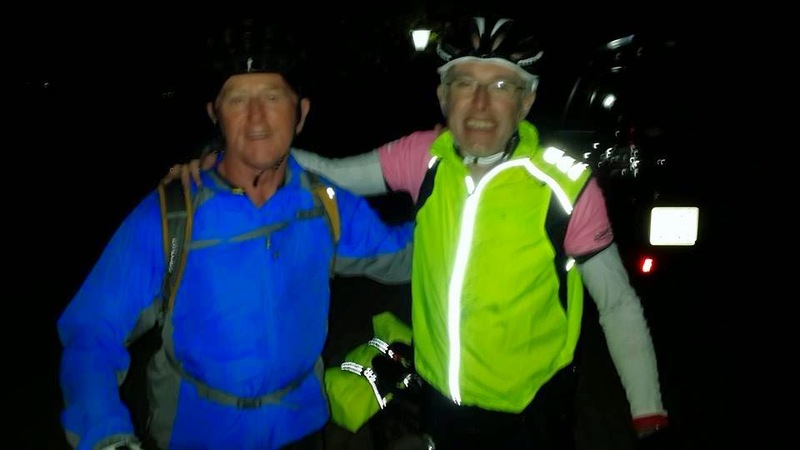 It was turning to full scale rain as we reached the outskirts of town – but with the Total petrol station in sight, all that was needed to avoid a drenching was a quick stand on the pedals and sprint into the shelter of the garage forecourt. There had been no real plan to stop long at this control – however the coffee machine in the corner said otherwise. For a 24hr filling station it was a little surprising to see a proper coffee machine, complete with a hopper of dark roast beans waiting to be ground. It would have been remiss of us not to at least check that the coffee tasted as promising as it looked. We were not disappointed – standing around drinking hot, delicious coffee whilst peering out into the dark and the rain. The idea of getting back onto the bikes and riding out for a proper soaking was not appealing, but it had to be done. There was still 280km of pedalling left to be done. When the Cape Audaxes were first being planned in March 2014, at least one voice was heard to say something along the lines of ‘any route as long as it’s not Hopefield again’. The back-story behind this was the 2011 qualifier series which had almost exclusively used west coast routes. As a result, the first draft of the 2014/15 brevets had no routes to the north and west, only in later iterations adding the 400km being ridden this weekend. None of the riders who’d originally requested avoiding Hopefield were on today’s ride, or took part in the previous edition in November 2014. Which was more than a little ironic – since this season’s crop of Cape Randonneurs have enjoyed a rather different experience of this unassuming little West Coast town. On our first visit, a wonderful lady named Ella had very kindly opened her café early and provided a fabulous breakfast and coffee. When organizing this weekend’s ride we contacted her to see if there was any chance she’d do the same again. Sadly she couldn’t, the café was closed. But with amazing generosity Ella had offered to make us all breakfast and coffee again, but this time on the stoep of her house. She didn’t have to ask us twice, we positively bit her hand off! A little after 7am we trudged up her drive, soggy and dishevelled from riding the past 30km through the rain, with regular extra showers of dirt and spray from trucks rushing past. Ella’s fabulous hospitality could not have been more welcomed or more timely. Lashing of hot coffee and plates piled high with cooked breakfast, it was quite literally a shelter from the storm. As we sat and ate, the clouds rolled back and the sun came up properly. Only one of us had thought to bring dry clothes, so it was a relief to feel the day warming up. It was difficult to tear ourselves away, but the remaining 250km of the ride beckoned and there was at least one remaining tough stretch ahead to be battled. Before moving on we must say the most sincere of Thank Yous to Ella for twice making Hopefield a place we’ve thoroughly enjoyed riding through. Our count of mechanicals was already standing at one puncture, and I added a broken rear spoke to that tally before we’d actually even left Hopefield. We’d heard it pop some time back, but annoyingly I forgot to check it whilst we had breakfast. Rather than hold the ride up, Ernst and Gideon helped me get it a little less wobbly and open the brake arches to lessen the brake blocks fouling. It wasn’t a great start to what proved to be the least pleasant leg of the ride, again. The Northerly winds were not quite as strong as they had been in November, but they were more than unpleasant. At least with seven riders we had a few more to share the workload this time around. It was a tough 40km or so, and not one I think will make the top ten list of favourite stretches for any of our riders. Without a doubt the most surreal thing I have witnessed on any Audax ride unfolded in Saldanha. Somehow our desire for food had landed us at a bay side hotel with a restaurant on the 3rd floor. The obvious decision would have been that this may not be a good fit for cyclists – but not to us at that time, we’d already stopped, and we wanted food. Even if it meant cramming ourselves and our bikes into possibly the world’s smallest lift. Yep – you did read that right. We were confronted with a miniscule lift cubicle, which could just about take two bikes if stood upright on their back wheels with their owners bent into variations contortions around them to squeeze inside far enough to avoid blocking the door. It’s almost impossible to explain why not one of us suggested riding on to look for somewhere else. Instead we just laughed at each other and the situation, and a couple of the guys took the stairs. 220km into a ride, why on earth did it seem like a good idea to be carrying our bikes up 3 flights of stairs? Honestly, you had to be there. The spectacular view outside the restaurant across Saldanha Bay was at least some consolation. The view inside the restaurant rather less so. Unless your idea of scenery is shabby cyclists, their shoes, their bikes, and other miscellaneous equipment sprawled all over the place. The restaurant were amazingly tolerant of our scruffy presence – to be fair though, they were hardly busy and we were not exactly a demanding crowd, well aside from cluttering up half their restaurant. We just wanted hot food and milkshakes. It wasn’t the best we’ve eaten on our rides, but it was more than good enough to refuel us for the next stage. At this point, I’m pretty much out of alliterations for the remaining controls … I mean what on earth would one use for Yzerfontein? In truth too, aside from a broken rear spoken for one of our other riders, and a couple more punctures, I don’t recall too many other unusual or remarkable events on the remaining 180km of the ride. The tail wind pushed up our pace significantly from Saldanha on, and the West Coast Park was as sublime as on the previous 400. Considerably fewer snakes this time, thankfully, but several Eland were spotted as we rode through. 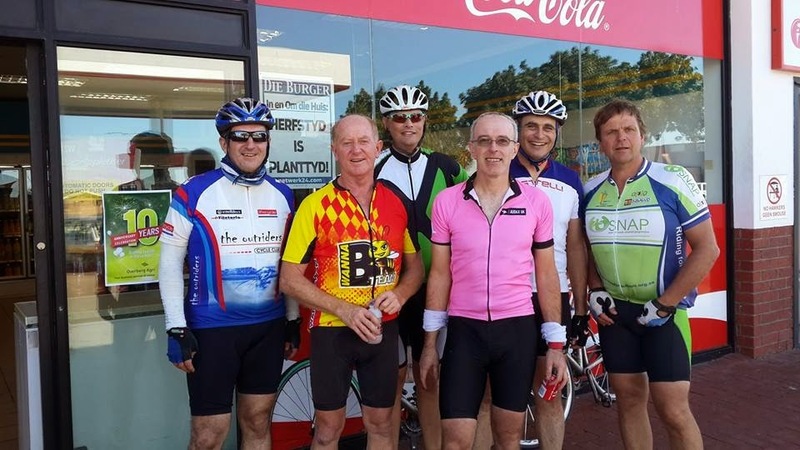 The tailwind died down on the final stretch from Malmesbury – but that was still infinitely preferable to the strong headwinds we have battled along that stretch on recent rides. With no wind, progress was rapid and even the tail group of riders were home well before midnight, three hours ahead of cut-off.